OK, so now it's on to the important stuff - what did Santa Paws bring me? Given that I have been a very well behaved Westie all year, I was expecting something quite special and special it was - the Two Legged Ones heard about Farfetched Doggie Delites - home baked, made to order treats and, because of my diet of no chicken, no wheat etc, this was great news. The She Two Legged One used to bake my treats but it's a bit harder now that I can't eat chicken, wheat (basically, anything that I used to love really) so she was really happy to find out about Farfetched. I told you in an earlier post that I had sneaked a peak of my present - well, it wasn't really my fault - the two lovely two legged ones, Nina and Liz, who run Farfetched were very kind and hand delivered my Xmas present - but I wasn't allowed to eat any of them until Christmas Day - I got two lollypaws (yum), Pooksies (especially made for four legged ones like me who can't eat wheat etc) and because apparently I need to lose weight (I still dispute this), some Waist Watchers. Delicious!!! Nina and Liz will have a 'live' website soon so you can order on line but in the meantime, if you want to try these amazingly delicious (and healthy - which, in my mind, means I can eat twice as many but well, in the Two Legged Ones' minds, this is not the case. Spoilsports) treats, you can contact them on farfetcheddoggiedelights@gmail.com. But, really, much as I love presents,the best part of Christmas is being grateful for all the wonderful things I have. 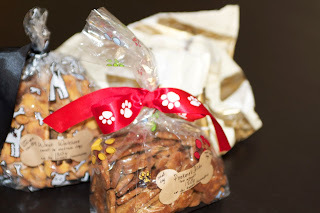 There is a photo of my present below - unfortunately, it doesn't do the treats justice as the She Two Legged One really is quite useless inexperienced with the He Two Legged Ones' camera ......... but trust me, these are some awesome treats. And by the way, a huge Happy New Year to you all. Here's to a happy, healthy and peaceful 2012. The snacks sound really yummy! My mom said I need to diet...I think my weight is pawsitively perfect! BOL!! I hope you have a great New Year!